If you have recently gotten engaged, you may be wondering what the current wedding trends are. Fortunately for us here in Northern California, the weather is mild and that makes it a bit easier to shop for a Spring/Summer gown. I hate to think about trying on a strapless dress during blizzard temperatures. 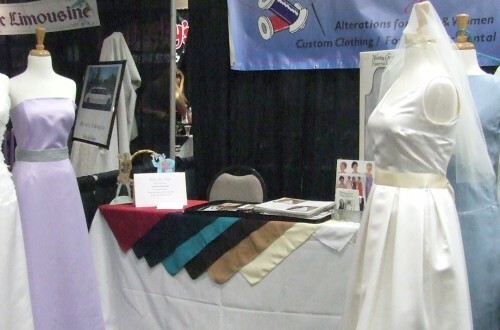 Wedding gowns come in all shapes, sizes, and colors now. So no matter what your figure is like, you can find a dress that suits you. There are many guides in magazines and on-line about what silhouette and color is right for your body type and skin tone but honestly, you won’t really know what works for you until you try on some gowns. I always recommend that a bride makes an appointment with her nearest bridal salon as soon as the engagement is set. Try on the gown that you think you want and then try on several silhouettes to be absolutely certain you have the style you want. Once you order it, it’s yours; most bridal salons have a no return policy. We’re still seeing strapless gowns, empire waists, ball gowns, Grecian looks but there are a few trends that are really popular this season. The most obvious one is color. A bride can now get a dress in champagne, pink, red, and even black! In fact, as I researched this article, I had a hard time finding white and ivory gowns. It’s a good thing because very few people look good in stark white and the ivory has to be just the right shade for your skin tone. Pink looks good on just about everyone and champagne and beige add lots of choices. As for red and black, well, first of all in some cultures, red is the preferred color for brides so I get that. And it might be fun for a Valentine’s Day wedding. I understand how some women may want to wear a black gown but it would have to be a very formal wedding. And I question whether or not the bride would feel “bride-y” enough. And what about a veil? I haven’t seen any black veils … yet. The most popular silhouette has got to be the fit-and-flare. “Fit-and-flare” is a term that encompasses anything from a mermaid shape to a more traditional A-line. We mostly think of the va-va-voom look, very close fitting through the bodice, hips and thighs, and flaring out at the bottom. And speaking of “va-va-voom”, old Hollywood glam is very popular this year. That fashion encompasses everything from the 30’s slinky to the Audrey Hepburn tailored look. 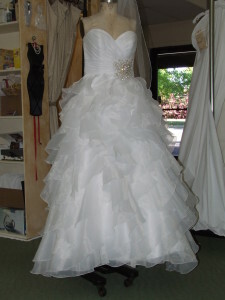 Another very popular trend is the “poofy” ball gown. The bodice is generally fitted to the natural waist and the skirt is over-the-top layers of tulle or organza. The trains on these dresses tend to be slight, what is called a “sweep”. Pockets are also very popular in the huge skirts. The biggest trend this year will be lace. We started to see it last year but I think it will be even more popular this year. Brides like the romance and the vintage look of it. But lace is a very personal preference so be sure to actually try on a lace gown before you order. It can be price-y, depending on the type of lace. A Chantilly or organza lace will be less expensive than a traditional Alencon and the more beading, the higher the cost. 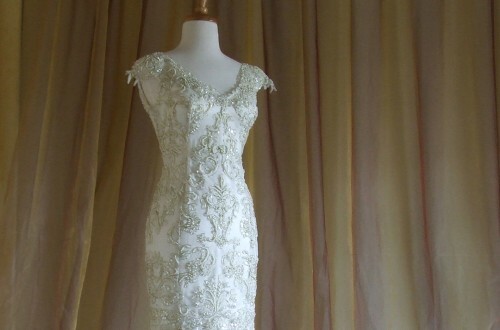 Also, lace will add to the alterations cost. 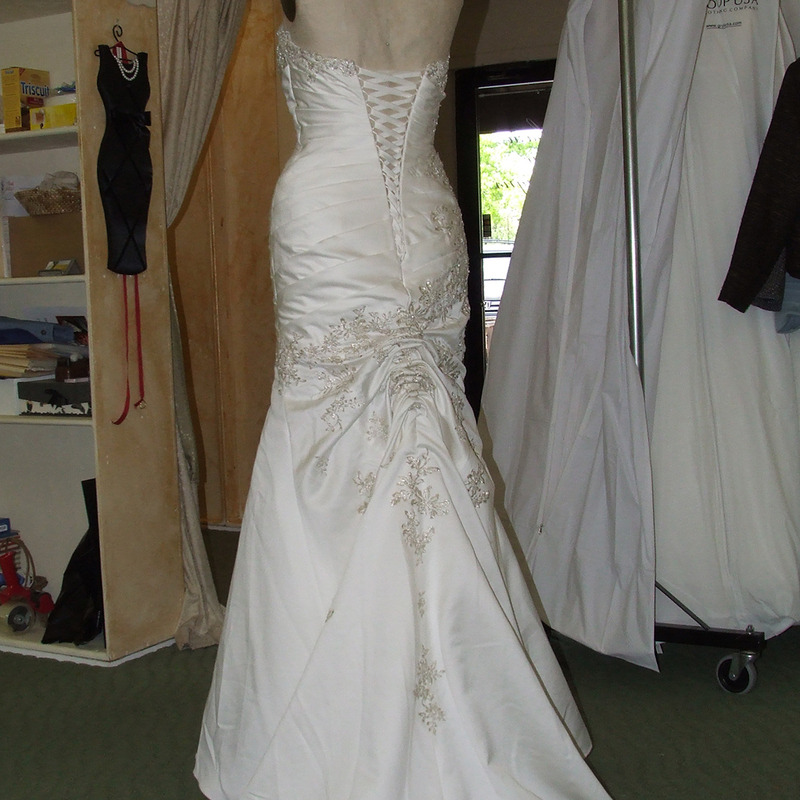 So if you are on a budget, you may want to go with a plainer lace or stay with satin or chiffon. A wedding gown is one of the most expensive garments a woman will ever buy so make sure you have plenty of time to choose just the right one and do make sure you have allowed enough time to get it altered properly. And no matter what design you choose, remember that they are all beautiful creations and you really can’t go wrong…kinda like the groom!